The Gambling Commission in the United Kingdom has released quite the comprehensive study on the consumers’ participation in gambling-related activities in Britain during 2016. 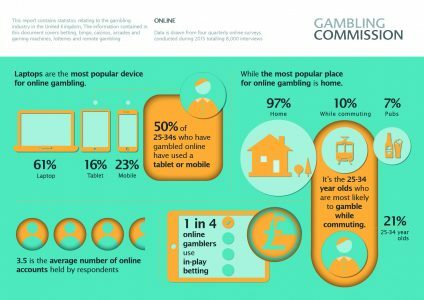 The report covers the awareness, attitudes, and behaviours of the users in relation to gambling, and some more general statistics on demographics. Populus gathered the data via a combination of online and telephone with people are at least 16 years old. The participation in gambling activities has seen an increase of 3%, with approximately 48% of individuals who are aged 16 or over having participated one or more forms of gambling in the past month. There are about 9% more male gamblers in the UK than female. Moreover, 17% of adults surveyed have used operators to gamble online. Casino games and Lotteries have seen an enormous increase in online participation, but rates of playing bingo in-person have also increased. The most popular gambling-related activity remains participation in The National Lottery. It is followed by scratch cards. Private and sports betting have also increased, by being mainly driven by the Rio Olympics 2016 and the UEFA Football Championship 2016. Approximately 0.7% of people identified themselves as problem gamblers according to the short-form called the Problem Gambling Severity Index (PGSI). Moreover, there are about 5.5% that identify themselves as at a moderate or low risk to develop a problem in the near future. Furthermore, nearly 39% of people have associated crime and gambling. However, there are 34% of individuals who believe that gambling can be trusted and even that it is fair.